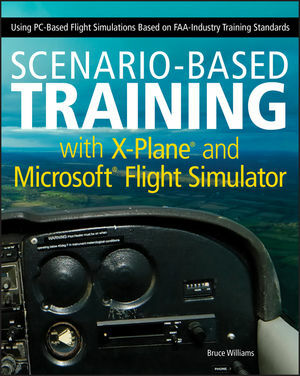 To allay confusion about the “situation” with the Situations that I created to complement the scenarios in my latest book, Scenario-Based Training with X-Plane and Microsoft Flight Simulator, here’s a little more information. As I explained earlier, the developer of X-Plane frequently updates the code, and each time he does, the format of the .sit files changes, and you may not be able to load the provided Situation. It’s not practical for me to recreate the Situations every time Austin updates X-Plane and to try to maintain an archive of the files for every version that folks may be using at any time. If he stabilizes the .sit format in future, I’ll create new Situations. But the Situations I provided are just a convenience. You can use any recent version of X-Plane with the scenarios described in each lesson. In fact, you could use the scenarios/lessons effectively with any simulation (FTD, PC-based, etc. ), provided that simulation has the required scenery, navaids, etc. Instructors can also use the scenarios and templates for lesson plans, as part of ground-school classes, flight planning exercises, challenges for practicing aeronautical decision making, and so forth. I focused on X-Plane and FSX because they’re the most popular, cost-effective PC-based simulations that are widely available. I documented the core features of those simulations (again, not especially dependent on a specific version) that help instructors, students, and pilots use them effectively to complement formal training or just have more fun with the hobby of virtual aviation. For more information about the book, visit its pages at my Website and at Facebook. Microsoft Flight, the successor to Microsoft Flight Simulator, is in beta. Now more details about the new game (Microsoft dropped simulator from the title) are emerging. You can find a summary from one person who attended the unveiling at Microsoft here. As I’ve noted elsewhere, the game will be offered as a free download. That initial release includes only a couple of aircraft and the scenery and activities are limited to Hawaii. Users eventually will be able to download additional scenery, aircraft, and activities from Microsoft, with each module coming at a price, as yet unannounced. According to the account above, however, Microsoft will not publish information about how to create add-ons for Microsoft Flight, and, apparently, it will not allow others to host or distribute additional content for the game. Everything will come from Microsoft. That latter point is telling, and it ends a decades-long practice that led to a worldwide community of developers and enthusiasts who created add-on aircraft, scenery, and features for the Flight Simulator franchise. The arrival of Red Tails in theaters (and to the disappointment of most reviewers, pilots and non-aviators alike) suggests that it might be time to revive a discussion of favorite aviation movies. This list, at Air & Space Smithsonian, is an excellent place to start, but it was published in 2006 and is therefore missing the latest flicks and some (corny) classics (e.g., Those Magnificent Men in Their Flying Machines) and many serials that included aerial adventures. On the other hand, I can’t think of many recent films that deserve honorable mention, especially given the trend toward CGI, which although capable of stunning visuals, has yet to reproduce realistic flying scenes. I’m sure the collective wisdom of the web can name scores of other examples. Feel free to contribute via comments. This change aligns the AIM guidance on the use of aircraft lights with AC 120-74A. This change adds language to inform pilots of what to expect from controllers concerning clearance limits and associated phraseology. TO THE FEDERAL AVIATION ADMINISTRATION: Revise the existing aircraft icing intensity reporting criteria (as defined in the Aeronautical Info Manual (AIM) and other FAA literature) by including nomenclature that is related to specific types of aircraft, and that is in logical agreement with existing Federal Aviation Regulation (FARs). Many pilots and flight instructors obsess about the fidelity of the “flight models” (the more formal term is “flight dynamics”) of PC-based simulations and flight training devices (FTDs). They equate detailed, accurate flight dynamics for specific aircraft with FAA approval, but the FAA actually imposes few specific requirements on the flight modeling for ATDs and BATDs [see AC 61-136 – FAA Approval of Aviation Training Devices and Their Use for Training and Experience]. Flight dynamics of the ATD should be comparable to the way the represented training aircraft performs and handles. However, there is no requirement for an ATD to have control loading to exactly replicate any particular aircraft.. . .
Aircraft performance parameters (such as maximum speed, cruise speed, stall speed, maximum climb rate, and hovering/sideward/forward/rearward flight) should be comparable to the aircraft being represented. Aircraft vertical lift component must change as a function of bank comparable to the way the aircraft being represented performs and handles. Changes in flap setting, slat setting, gear position, collective control, or cyclic control must be accompanied by changes in flight dynamics comparable to the way the M/M of aircraft represented performs and handles. The presence and intensity of wind and turbulence must be reflected in the handling and performance qualities of the simulated aircraft and should be comparable to the way the aircraft represented performs and handles. In fact, with regard to FTDs and all ATDs and BATDs, the FAA is most concerned with the controls, instruments, and switches in the cockpit and the visual displays than it is with the detailed handling qualities of the simulation–provided the virtual aircraft, in general, behaves like a single-engine or multiengine airplane. Now, this isn’t to suggest that flight dynamics aren’t important, or that flight simulations shouldn’t strive for high fidelity. But implicit in the FAA approval standards is the idea that FTDs, ATDs, and BATDs can play many roles in aviation training without having to replicate a specific make, model, or type of aircraft. That’s a central theme of my two books about using PC-based simulations in flight training, Scenario-Based Training with X-Plane and Microsoft Flight Simulator: Using PC-Based Flight Simulations based on FAA and Industry Training Standards (published January 2012) and Microsoft Flight Simulator as a Training Aid (published in January 2007). If you’re considering using a simulation to complement your training, focus on what PC-based simulations, including BATD and ATD, do best–help you learn and master important skills and procedures–how to think like a pilot. Don’t dismiss a simulation just because it doesn’t exactly reproduce the aircraft you fly. ESTABLISHED−To be stable or fixed on a route, route segment, altitude, heading, etc. A more detailed definition of established in the AIM (see below) focuses on RNAV and RNP operations. (For most general aviation pilots, that means GPS/WAAS procedures.) It’s the result of a long discussion among members of the FAA Aeronautical Charting Forum–Instrument Procedures Group. The topic (item 96-01-166) began as a discussion of “on course” but eventually narrowed its focus to “Determining Descent Point of Flyby Waypoints,” which is another way of stating the primary issue: When is it OK to descend (consistent, of course, with your last clearance from ATC) as you join the next segment of an approach or transition? 11. Definition of “established” for RNAV and RNP operations. An aircraft is considered to be established on-course during RNAV and RNP operations anytime it is within 1 times the required accuracy for the segment being flown. For example, while operating on a Q-Route (RNAV 2), the aircraft is considered to be established on-course when it is within 2 nm of the course centerline. NOTE: Pilots must be aware of how their navigation system operates, along with any AFM limitations, and confirm that the aircraft’s lateral deviation display (or map display if being used as an allowed alternate means) is suitable for the accuracy of the segment being flown. Automatic scaling and alerting changes are appropriate for some operations. For example, TSO-C129 systems change within 30 miles of destination and within 2 miles of FAF to support approach operations. For some navigation systems and operations, manual selection of scaling will be necessary. (a) Pilots flying FMS equipped aircraft with barometric vertical navigation (Baro-VNAV) may descend when the aircraft is established on-course following FMS leg transition to the next segment. Leg transition normally occurs at the turn bisector for a fly-by waypoint (reference paragraph 1-2-1 for more on waypoints). When using full automation, pilots should monitor the aircraft to ensure the aircraft is turning at appropriate lead times and descending once established on-course. (b) Pilots flying TSO-C129 navigation system equipped aircraft [i.e., non-WAAS GPS] without full automation should use normal lead points to begin the turn. Pilots may descend when established on-course on the next segment of the approach. *To keep up with substantive changes to the AIM in each new edition, see the Explanation of Changes sections published at the AIM home page. You can find PDF versions of the AIM and updates here. The FAA recently published information about its plans to shut down VORs as it transitions to a GPS-based navigation system, an overhaul that’s part of the NextGen program. Update: FAA Proposed Policy for Discontinuance of Certain Instrument Approach Procedures. Although this proposal is not directly related to the VOR Minimum Operational Network, it’s of interest to pilots who rely on ground-based navigation aids under IFR. Now, at the behest of AOPA, FAA has released a few specifics about the proposal, including the map below that shows which VORs (green) will remain as others (red) are shut down, no later than 2020. 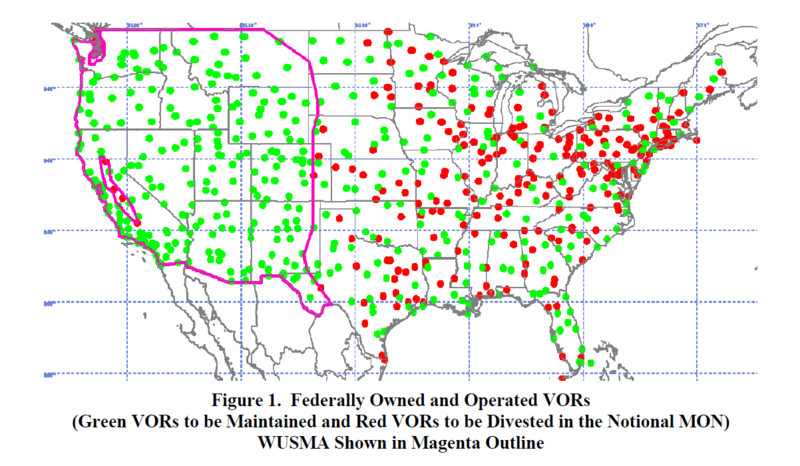 FAA is planning on removing many of the 954 federally-owned and operated VORs and establishing a Minimum Operational Network (MON) of VORs not later than 2020…The purpose of the MON is to maintain a backup navigation capability to provide service for VOR-equipped aircraft in case of a GPS outage. In the MON, all VORs will be retained in Alaska, the Western U.S. Mountainous Area (WUSMA), and U.S. Islands and territories. The MON will provide a safe landing for VOR-equipped aircraft flying under IFR in the case of a GPS outage. However, in general, the MON will not provide an efficient or useable navigation network for VOR-only aircraft (i.e., aircraft not equipped with GPS or Wide Area Augmentation System (WAAS) avionics). VOR-based navigation using only the MON would likely be circuitous, and not all airports will have instrument approaches that will be useable by VOR-only aircraft. The MON could be used by aircraft flying under Visual Flight Rules (VFR), but the primary purpose of the MON is to support safe landing of IFR aircraft during a GPS outage. In considering VORs for discontinuance, each facility will be evaluated on its own merits. The FAA will convene a working group that will develop a candidate list of VORs for discontinuance using relevant operational, safety, cost, and economic criteria. As part of the process, this working group will engage aviation industry stakeholders and other members of the public for input. For more details about the plan to shut down VORs, see the AOPA summary and the FAA white paper, which includes additional maps and tables, here. Comments on the FAA’s proposal are due March 7, 2012.